For the first time in the club’s nearly 100-year history, Spartak fans have a place to call their own. RBTH editor Alexandra Guzeva was at the ground to witness the exciting event. “Next stop, Spartak.” Crowds of football fans flood out of the trains at the Spartak metro stop in northwestern Moscow, heading to a new stadium to watch their favourite team play. 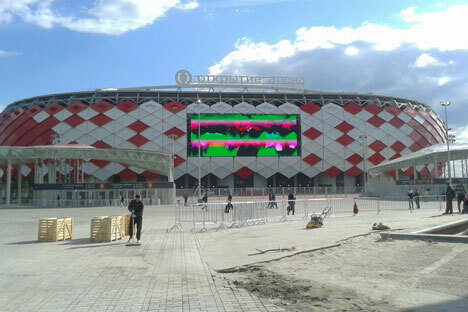 On September 5, 37,000 people attended the opening of Otkrytie Arena - the first stadium Spartak can call its own in its 92-year history. Dressed in their Spartak colours of red and white, the fans converged on the arena, which is decorated in matching red and white. On their way, they passed an enormous statue of a gladiator – the club’s mascot. Long lines formed at the entrance to each section of the stands as fans waited for their chances to see inside the new stadium. The crowd was diverse: fanatic “ultra” supporters (the cornerstone of the fan movement), adults and experienced fans, fans’ girlfriends and girl fans, and families with small children, who will have already pledged their allegiance to one club and one club only. The friendly match against the Serbian team Red Star Belgrade, which marked the opening of the arena, seemed of little interest to the visitors – everyone was too eager to see the stadium itself. After a long ordeal involving leased fields, now Spartak, its fans, and a whole history have received a home of their own. The stadium, not yet fully cleaned of construction dust, is quite sparse inside, boasting just a few stalls offering snacks and non-alcoholic beer, which had run out before the match even started. There were also many, many police officers preventing visitors from passing between sections of the arena. Entry into the stadium was a ritual in itself; the security guard searched my entire bag, feeling for bottles. Upon entering the stands, every visitor expelled a rapturous sigh, much like a groom would upon seeing his bride decked out in her wedding dress for the first time. The football players were met with standing ovations as they ran onto the field, and Spartak’s pre-match anthem was performed by rocker Kipelov, who was quivering with emotions. Social media were bombarded with photos with hashtags like #Spartak, #SpartakIsHome, and #WelcomeHome. Fans had prepared beforehand and unfurled an enormous cloth across two of the grandstands, which revealed images of the club’s founder, the gladiator, and the representative Spartak fan. It’s as if all of the club’s fans were there at the stadium that day. Before the opening, rumours abounded that fans of other clubs wanted to spoil the party mood by causing trouble. The potential culprits would have been fans of Spartak’s sworn rivals, CSKA, which is also waiting for its own new stadium. However, a more peaceful (or secure) place could not have been found in Moscow that day. Mothers did not have to worry about their sons out watching football. And contrary to the view that Russian football fans are considered some of the most aggressive, they were pacified by the new stadium, which would have been a fine venue even for the opening of the Olympic Games.